Opioid Epidemic Leads 6 States To Declare Public Health Emergencies : Shots - Health News President Trump announced Thursday that his administration plans to declare a national emergency to deal with the opioid epidemic. Six states have already taken this step. Overdoses from heroin and other opioids have led six states to declare public health emergencies. Public health officials and others concerned about the nation's opioid crisis are hailing President Trump's decision to declare it a national emergency. 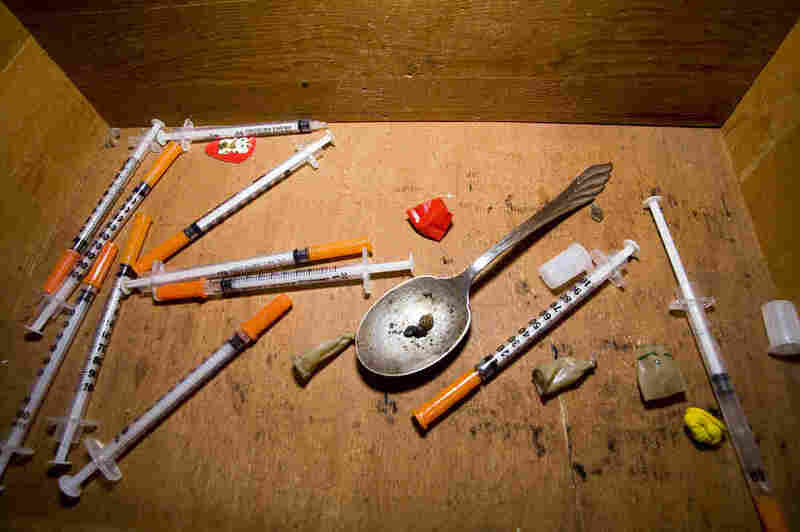 A Presidential commission on opioids said in its interim report that an emergency declaration would allow the administration to take immediate action and send a message to Congress that more funding is needed. But while the Trump administration prepares the presidential order, governors in six states have already declared emergencies to deal with opioids. They range from Alaska and Arizona in the West to Florida, Virginia, Maryland and Massachusetts in the East. In Maryland, where 550 overdose deaths were reported in just the first three months of this year, Gov. Larry Hogan declared opioids a public health emergency in March. "It's a call to order and a call to action," says Clay Stamp, head of Maryland's Opioid Operational Command Center. Stamp comes to the job with a background as an emergency manager and compares this effort to the state's response to a hurricane. "We need all the right people in the room to make sure we can make a decision in time to move people out of harm's way, shelter them and everything else," he says. "This is no different." Since declaring an emergency, Maryland has tightened practices for those prescribing opioids and received a waiver to allow Medicaid to pay for residential drug treatment. Massachusetts was the first state to declare opioids a public health emergency in 2014. Then-Gov. Deval Patrick acted on the recommendations of a special task force, says Michael Barnett, an assistant professor of health policy and management at the Harvard T.H. Chan School of Public Health. The recommendations were "to open up funding for the Department of Public Health — for instance, to open up more treatment beds, to create funding and make it easier for ... first responders to use naloxone, which reverses opioid overdoses in the field," he says. Making naloxone freely available and putting it in the hands of more people has helped save lives. That has been one of the most immediate impacts of emergency declarations in states that have issued them. Arizona Gov. Doug Ducey declared a public health emergency in June. Will Humble, executive director for the Arizona Public Health Association says with that declaration, the state began gathering badly needed data on the crisis. "Who it's hitting, where it's hitting, who is doing the prescribing, what portion of it are fentanyl and heroin and what portion are prescribed pills," he says. "And, as you get that more complete information, it allows you to craft better public policy." In Florida, the emergency declaration issued in May enabled Gov. Rick Scott to quickly allocate some $27 million in federal funds for drug treatment and prevention. Palm Beach County, Fla., saw nearly 600 fatal overdoses last year, mostly related to opioids. Alton Taylor, executive director of the county's Drug Abuse Foundation says although the emergency declaration was welcome, Palm Beach County and the rest of the state still don't have enough publicly-funded beds available to treat people with opioid addictions. "Today as I'm talking to you, we have over 200 people on a waiting list," he says. "These are people where we've done a clinical assessment of them and determined them to be in need of that service." Despite the emergency declaration, Florida, unlike some other states, hasn't tapped Medicaid to help pay for drug treatment. Taylor says he's hopeful President Trump's emergency declaration, when finalized, will free up more money to treat people in recovery from opioid addictions.